Start off your visit on the 19th (Sat): examine the collection at Royal Ontario Museum and then appreciate the extensive heritage of The Distillery District. For where to stay, other places to visit, and tourist information, you can read our Toronto trip itinerary website . If you are flying in from Canada, the closest major airports are Lester B. Pearson International Airport and Billy Bishop Toronto City Centre Airport. In May in Toronto, expect temperatures between 22°C during the day and 12°C at night. Wrap up your sightseeing on the 20th (Sun) early enough to travel to Ponta Delgada. Kick off your visit on the 21st (Mon): stroll through Praia de Santa Barbara, contemplate the waterfront views at Lagoa do Fogo, and then take in the spiritual surroundings of Nossa Senhora da Paz. On the 22nd (Tue), you'll have a packed day of sightseeing: take in the dramatic natural features at Caldeira das Sete Cidades, then take some stellar pictures from Boca do Inferno Viewpoint, then identify plant and animal life at Environmental Interpretation Centre of Caldeira Velha, and finally take in the architecture and atmosphere at Igreja do Santo Cristo. To find where to stay, ratings, reviews, and tourist information, refer to the Ponta Delgada day trip planning site . Traveling by flight from Toronto to Ponta Delgada takes 9.5 hours. The time zone difference moving from Eastern Standard Time (EST) to Azores Time (AZOT) is 4 hours. Plan for a bit warmer nights when traveling from Toronto in May since evenings lows in Ponta Delgada dip to 17°C. Wrap up your sightseeing on the 22nd (Tue) early enough to travel to Lisbon. We've included these beaches for you: Praia da ursa and Praia Grande. Popular historic sites such as Castelo de S. Jorge and Belém Tower are in your itinerary. Spend the 25th (Fri) on two wheels at Portugal Bike. Next up on the itinerary: contemplate the long history of Jeronimos Monastery and choose your vessel at Nosso Tejo. To see photos, other places to visit, maps, and more tourist information, read our Lisbon journey maker tool . You can fly from Ponta Delgada to Lisbon in 5 hours. The time zone changes from Azores Time (AZOT) to Western European Time (WET), which is usually a 1 hour difference. While traveling from Ponta Delgada, expect a bit warmer days and about the same nights in Lisbon, ranging from highs of 28°C to lows of 15°C. Wrap up your sightseeing on the 26th (Sat) early enough to drive to Fatima. Fátima is a civil parish in the municipality of Ourém, in the Portuguese Santarém District. For other places to visit, more things to do, reviews, and tourist information, read Fatima trip itinerary planner . Traveling by car from Lisbon to Fatima takes 1.5 hours. Alternatively, you can take a bus. When traveling from Lisbon in May, plan for little chillier days and about the same nights in Fatima: temperatures range from 24°C by day to 13°C at night. Wrap up your sightseeing by early afternoon on the 26th (Sat) to allow time for the car ride to Seville. 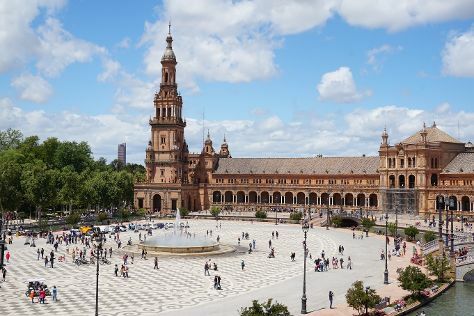 A city of rich Moorish heritage, Seville is the cultural and financial center of southern Spain, and the site of numerous festivals throughout the year. Kick off your visit on the 27th (Sun): admire the striking features of Plaza de España, then step into the grandiose world of Royal Alcázar of Seville, then contemplate the long history of Plaza de Toros de la Maestranza, and finally don't miss a visit to Metropol Parasol. On your second day here, admire the natural beauty at Casa de Pilatos, wander the streets of Barrio Santa Cruz, then take in the spiritual surroundings of Seville Cathedral, and finally wander the streets of Triana. To find where to stay, ratings, and more tourist information, go to the Seville online tour planner . You can drive from Fatima to Seville in 5 hours. Other options are to do a combination of bus and flight; or do a combination of bus and flight. The time zone difference moving from Western European Time (WET) to Central European Time (CET) is 1 hour. Expect a bit warmer weather when traveling from Fatima in May: highs in Seville hover around 34°C, while lows dip to 17°C. Wrap up your sightseeing on the 29th (Tue) to allow time to drive to Granada. 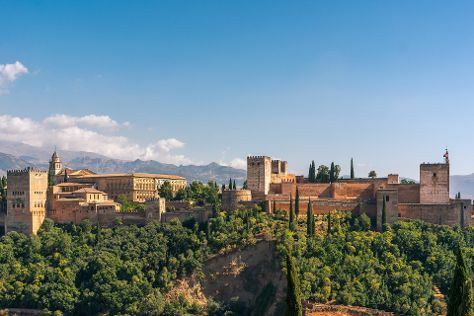 Granada boasts numerous well-preserved examples of exquisite Moorish architecture, not the least of which is the Alhambra, an ancient citadel and royal palace. Kick off your visit on the 29th (Tue): steep yourself in history at Generalife, then admire the landmark architecture of Alhambra, and then appreciate the extensive heritage of Mirador de San Nicolas. Inspirock's itinerary builder makes planning a Granada trip simple and quick. You can drive from Seville to Granada in 3 hours. Other options are to take a bus; or take a train. Traveling from Seville in May, expect nights in Granada to be about the same, around 14°C, while days are slightly colder, around 30°C. Finish your sightseeing early on the 30th (Wed) to allow enough time to travel to Madrid. On the 30th (Wed), see the interesting displays at Museo Nacional del Prado, wander the streets of Barrio de Salamanca, and then contemplate the waterfront views at Retiro Park (Parque del Retiro). Get ready for a full day of sightseeing on the 31st (Thu): admire the striking features of Royal Palace of Madrid, then wander the streets of Paseo de la Castellana, then take a stroll through Gay Madrid & the Chueca District, and finally take a stroll through Gran Via. To find traveler tips, where to stay, maps, and more tourist information, use the Madrid trip itinerary planner . Fly from Granada to Madrid in 4 hours. Alternatively, you can drive; or take a bus. May in Madrid sees daily highs of 28°C and lows of 13°C at night. Finish your sightseeing early on the 1st (Fri) to allow enough time to take a train to Barcelona. Start off your visit on the 1st (Fri): pause for some photo ops at Casa Batlló, wander the streets of El Barri Gòtic, then kick back and relax at La Barceloneta, and finally take in the spiritual surroundings of Basilica of Santa Maria del Mar. Here are some ideas for day two: admire all the interesting features of Camp Nou, make a trip to Park Güell, and then admire the landmark architecture of La Sagrada Familia. To find more things to do, ratings, and tourist information, use the Barcelona tour builder app . Traveling by train from Madrid to Barcelona takes 2.5 hours. Alternatively, you can fly; or drive. Traveling from Madrid in June, you will find days in Barcelona are a bit cooler (30°C), and nights are about the same (22°C). Wrap up your sightseeing on the 3rd (Sun) early enough to travel to London. Westminster Abbey and St. Paul's Cathedral will appeal to history buffs. Escape the urban bustle at Shadwell Basin outdoor Activity Centre and Imperial Bird of Prey Academy. And it doesn't end there: steep yourself in history at Tower of London, take in nature's colorful creations at Buckingham Palace, see the interesting displays at Madame Tussauds London, and work some fitness into your day at Tooting Common. For reviews, where to stay, maps, and tourist information, read our London trip maker website . Traveling by flight from Barcelona to London takes 5 hours. Alternatively, you can take a train; or do a combination of taxi, train, and car. Traveling from Barcelona to London, you'll gain 1 hour due to the time zone difference. In June, London is little chillier than Barcelona - with highs of 23°C and lows of 13°C. Wrap up your sightseeing by early afternoon on the 9th (Sat) to allow time for travel back home.